The fun began even before the concert started, since the bar was serving what it called a “Cosmique Tonique”, a drink presumably invented by Kubin himself. I think this was a standard gin and tonic with the addition of some magical ingredient that didn’t affect the taste of the drink but had the happy effect of making it give off industrial quantities of dry ice. The concoction seemed of a piece with the general air of retro-futurism that Kubin exudes, and I was at first reluctant to drink it, although it would have been a shame not to, so I did. 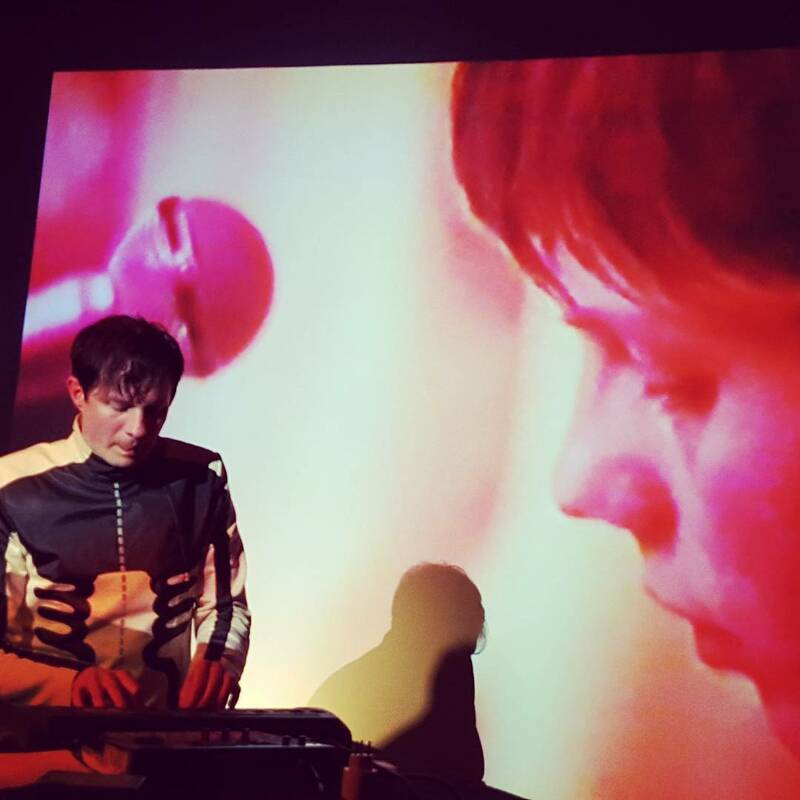 Standing at an extended workstation with video screens behind him, Kubin delivered warm, danceable, infectious synth pop. As one not exactly au fait with what has happened in this genre since Kraftwerk, I was highly impressed by the way Kubin’s persuasive voice and pristine melodies unfolded around intricate beats and whizzy electronic effects. Yet for all its evident good humour and generosity, there was nothing fluffy or whimsical about this music. Dedications to Vainio and Conrad Schnitzler were ample evidence, if any were needed, of the clear-minded intentness of purpose that Kubin brings to his art. The evening was as much a treat for the eyes as it was for the ears. Wearing a tailored suit that made him look like some kind of urbane cosmic traveller, Kubin shimmied happily around the stage with a smile that never left him for long. When his nimble fingers weren’t enticing another winning tune from his several keyboards, they were engaged in an “air piano” routine that brought the house down. The back-projected videos, meanwhile, added a further playful element to proceedings, not to mention the strangely moving sight of Kubin playing along to a film of himself at the age of fifteen (see photo). If this is the music of the future, bring it on. This entry was posted in Geneva, Live and tagged cave 12, felix kubin, Geneva by viennesewaltz. Bookmark the permalink.